Our fall 2015 survey found widespread discontent with the federal government, including deep distrust in government and considerable cynicism about politics and elected officials alike. But despite these negative assessments, majorities believe government does a good job on many issues and want it to have a major role on a wide range of policy areas. 1The public’s trust in government remains at historic lows. Today, just 19% say they trust the federal government to do what is right always or most of the time, which is little changed from recent years. Fewer than three-in-ten Americans have expressed trust in government in every major national poll conducted since July 2007 – the longest period of low trust in government seen in more than 50 years. 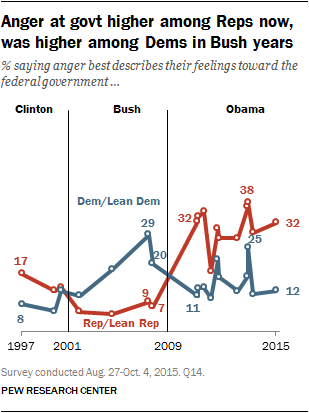 2 As in the past, the public’s feelings about government run more toward frustration than anger. Currently, 57% are frustrated with the federal government; 22% are angry, while 18% are basically content. Far more Republicans (32%) than Democrats (12%) say they are angry with the government. But higher shares in both parties expressed anger toward government in October 2013, during the partial government shutdown. While anger at government has been higher among Republicans than Democrats during Barack Obama’s administration, the situation was reversed during George W. Bush’s presidency: In October 2006, 29% of Democrats said they were angry with government, compared with just 9% of Republicans. 3Despite their widespread cynicism, most Americans give government good ratings in a number of areas. Half or more say the federal government is doing a “very good” or “somewhat good” job in 10 of the 13 governmental functions tested in the survey. However, the federal government receives particularly low marks in two key areas: Managing the nation’s immigration system and helping people get out of poverty. Nearly seven-in-ten (68%) say the government does a very or somewhat bad job in managing the immigration system; just 28% say it is doing a good job. Ratings are nearly as negative when it comes to the federal government’s efforts to help people get out of poverty: 61% say the government is doing a bad job in this area, while 36% give it a positive assessment. Majorities say the government should have a major role in dealing with 12 of 13 issues included in the survey. 4Americans are harshly critical of elected officials. The public views politicians as more selfish and considerably less honest than ordinary Americans. Just 29% say that “honest” describes elected officials very or fairly well, a much smaller share than those who describe the average American as honest (69%). Most people do say the term “intelligent” describes elected officials very or fairly well (67%). However, just as many view the typical American as intelligent. And when asked if elected officials or ordinary Americans could do a better job of solving the nation’s problems, 55% say ordinary Americans could do better. While negative opinions of politicians are not new, the perception that elected officials don’t care about what people think is now held more widely than it has been in recent years. Today, 74% say this, compared with a narrower 55% majority who said the same in 2000. 5 Congress is not the only institution the public sees as having a negative influence on how things are going in the country today. Majorities see the national news media (65%) and the entertainment industry (56%) as having a negative impact on the country. By contrast, overwhelming majorities see small businesses (82%) and technology companies (71%) as having a positive impact. 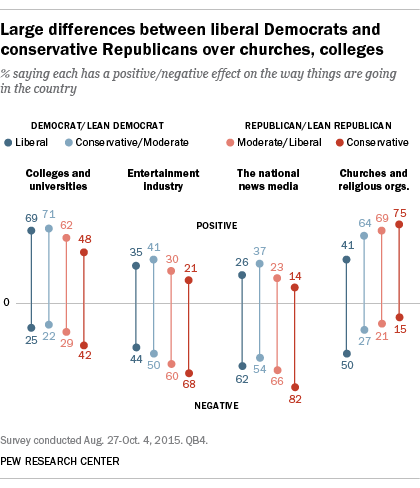 There are substantial partisan and ideological divides in the views of several of these institutions. For example, nearly seven-in-ten liberal Democrats (69%) say colleges and universities have a positive impact on the country, compared with just less than half (48%) of conservative Republicans. Conversely, fully three-quarters of conservative Republicans say that churches and religious organizations have a positive impact on the country, while just 41% of liberal Democrats agree. 6 “Angry” Republicans view Jeb Bush less favorably than several other GOP candidates. Among the nearly one-third of Republicans and leaners who say they are angry with government, about six-in-ten or more say they have favorable views of Ben Carson, Marco Rubio, Donald Trump and Ted Cruz. However, just 36% of Republicans who express anger toward government view Jeb Bush favorably, while 57% express an unfavorable opinion of him.